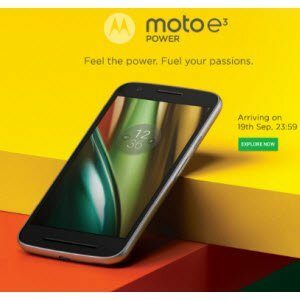 Moto E3 Power + Free 32GB Card + Launching offer Rs. 7199 (SBI Cards) or Rs. 7999 – Flipkart. Flipkart introducing the all-new Moto E3 Power Mobile at Rs. 7999. Powered by Quad core processor, 2GB Ram, a long-lasting 3,500mAh battery, 12.7cm (5) HD Display and 4G VoLTE connectivity. Buy this mobile on 20th Sep and avail some launching offer. Quad core 64 bit processor, 2GB ram and Android™ 6.0 support. 16GB internal ROM and 32GB microSD support. Carefree with water repellent nano coating & a smudge free screen. 4G LTE connectivity & voLTE. 8MP front camera with LED flash, burst mode, panorama & 720p HD video. 10W rapid in box charger that gives you 5 hours of battery life in just 15 mins! 3500 mAh battery that lasts throughout the day and into the night! 5” 720p HD display with 294 ppi. Extra Rs. 800 off with State Bank Debit and Creidt cards. How to Buy online Moto E3 Power Mobile?